For most people retirement and downsizing means a real change in approaches to daily activities. The things that were “must haves” when children were still at home are not only less important but may not be needed at all in a downsized home. This is not so much letting go as truly moving forward. If you are lucky the guest rooms you carefully planned for your home will be a revolving door of friends, children and grandkids. No, not an Air BNB, but a destination that the people you love will visit often. All too often for empty nesters the glorious and tasteful space set aside for guests remains largely unused. This Honest Abe homeowner used a craft room as a dual space in a North Carolina mountain vacation home. That makes the design of new spaces as important as the decluttering and disposal performed before a move. Since the point of downsizing is to decrease the amount of square footage, every inch of the home should be planned for optimal use when guests are not present as well as when they are. So, instead of a traditional guest room, many of Honest Abe’s plans provide options to incorporate home office space. We’ve seen homeowners use a loft or a sunroom for the home office, and many choose to modify plans exclusively to accommodate a home office. Some Honest Abe homeowners, however, created an office from a second bedroom and designed it so that it is quickly converted to guest quarters as needed. So, where do overnight guests sleep in a dual office/bedroom? One recent Honest Abe customer designed such a space and bought a vintage Murphy bed for use by guests. It looks like a piece of furniture, but by night, it is a comfortable bed. 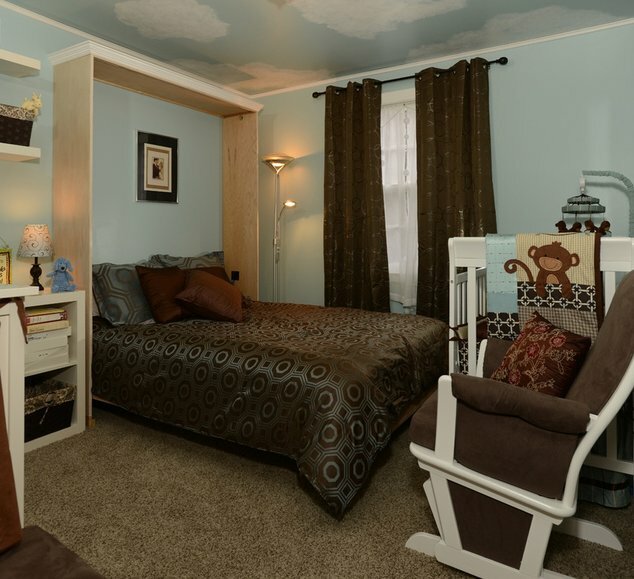 Murphy-style beds can be built directly onto the wall as well. See the sidebar interview with the owner of Nashville Murphy Beds, who discusses why a Murphy bed is perfect for a log home. Ask our design professionals at Honest Abe how to incorporate a hidden bed design into the plan while the plan is being created. A high quality sofa bed is a good investment. It will not only serve as seating for guests, it’s a great spot for a nap or a moment of relaxation from work. When guests are present, it converts to a comfortable bed at night. We’ve seen homeowners who’ve downsized and now keep a supply of inflatable mattresses for guests who are young or young at heart. Modern technology has made it possible to inflate and deflate the beds quickly, and they are designed for stability and comfort. In addition to design modifications for work and sleeping, these dual rooms incorporate private access to a full bath, direct access to the outside and an ample storage closet. Privacy is important, whether it is a professional visitor to the office or overnight guests. A bathroom with can be accessible to another area of the house, such as a great room, through a second door so that the room can be locked from each side. Installing an exterior door allows the office user to greet professional guests or step outside for a break. It also means guests can come and go as needed without disturbing the homeowners’ routine. Designating an area for storage serves the dual purpose handling office necessities and providing a place for suitcases and quests’ belongings. If a home office is less important, there may be other lifestyle interests that will make a traditional guest room into a regularly used space. 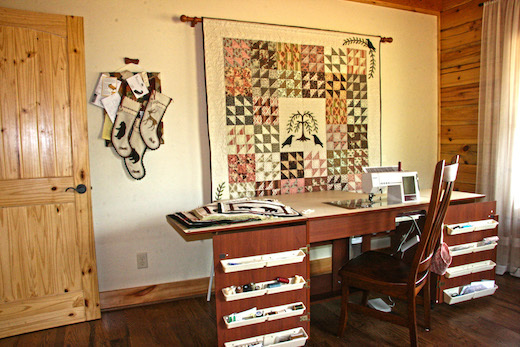 Maybe you are a crafter or have dreamed of a sewing room? Or maybe you want a legit “hold it in your hands” library space to read that next novel? There are many options for designing truly flexible space that can be converted in a matter of minutes as the need for the space changes. Our Honest Abe sales representatives and design team know how to make the most of every square foot to fit a downsized lifestyle. Billy Simon has been crafting furniture for years. 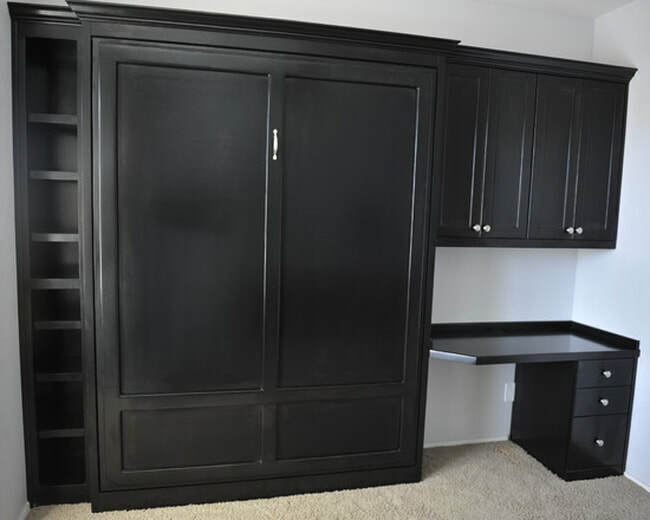 After making a Murphy bed for his own family and friends, he decided to offer them to whoever might be interested – kind of as a craftsman-for-hire. Eventually, he realized there was a demand in middle Tennessee for space-saving products, especially wall beds. So, after building a new woodworking shop behind his home in south Nashville, Billy founded Nashville Murphy Beds. Honest Abe Log Homes interviewed Billy to learn more about how a Murphy bed can benefit Honest Abe Log Homes customers. 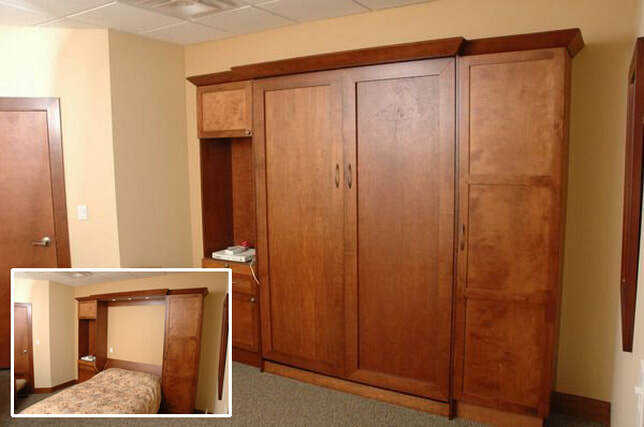 HALH: Why is a Murphy bed perfect for a log or timber frame home or cabin? Billy: Besides the fact that an extra luxurious bed from out of nowhere is always a positive, Nashville Murphy Beds are hand-made and can display the beauty of natural wood like the timbers around it. HALH: How does the concept of a Murphy bed fit into the need for downsizing? Billy: The Murphy bed was invented specifically for this reason by William L. Murphy in the early 1900s! Simply put, if you can free the floor space in a bedroom by storing the bed against or inside the wall you wind up with an extra room! Billy: Value in a vacation home or second home is greatly increased when more of your family or friends can comfortably join you in your memory making! This is also valuable when renting a property because you can accommodate more guests than your competitors. HALH: How versatile can the design be of a Murphy bed be? Billy: Optional trim styles, foldout tables, artwork, shelves, hooks, etc., can be incorporated into a Murphy bed to fit the customer’s needs or ideas. HALH: Are your beds custom designed and crafted specifically to a customer’s need and home design? Billy: At Nashville Murphy Beds we are set apart from most competitors because we begin with the customer’s vision then proceed to match the build/finish to those needs/ideas. HALH: How safe are Murphy beds? Billy: Our wall beds are not built with particleboard or cheaper material like so many pre-fab furniture pieces are these days. These products can be very beautiful and clean and last pretty well too but in the case of a large cabinet that holds hundreds of pounds of stress, the strength and quality of furniture grade plywood is essential! High quality plywood is actually stronger than solid wood and cannot crack or warp. When properly anchored to your wall’s studs, our beds are absolutely safe. With our hydraulic pistons the bed takes very little effort to pull down and lift back up! HALH: Why would choosing Nashville Murphy Beds be a good decision for Honest Abe’s customers, and can they be shipped around the country? Billy: We have a love and respect for the incredible resource of wood. This great gift to humanity is celebrated through Honest Abe Log homes. Log homes are like cathedrals to our early way of life, and Nashville Murphy Beds serves the community with this same spirit. We take great pride in quality and build our beds strong to be considered heirlooms! Also, we are now growing from a local business to nationwide by adding the logistics to ship to the continental U.S.
HALH: Who installs the bed? Billy: We install all our Murphy beds within 100 miles. Part of our shipping logistics include working with qualified handy men in other cities, and we are also developing a DVD showing step by step instruction in the case the buyer chooses to perform the install. HALH: Are there any other space saving pieces you create suitable for a log or timber frame home or cabin? 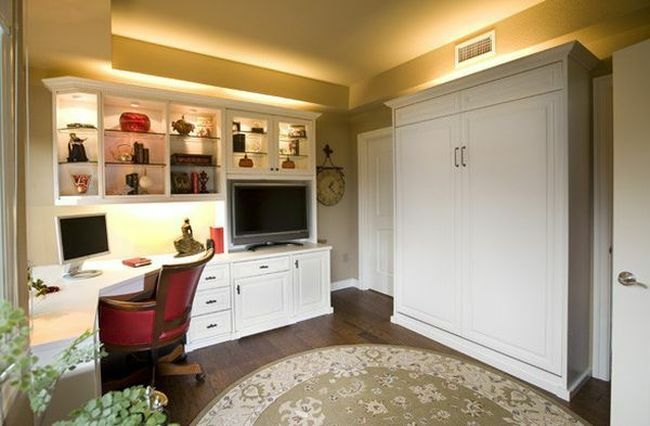 Billy: We have created shelves/cabinets that can surround your Murphy bed. All creations are custom so we start with the space and the need then brainstorm to fill it with the customer’s needs. Contact Billy HERE. Tell him Honest Abe Log Homes sent you, and ask your Honest Abe Sales Representative or Independent Dealer to help you incorporate a Nashville Murphy Beds original design into you floor plan.